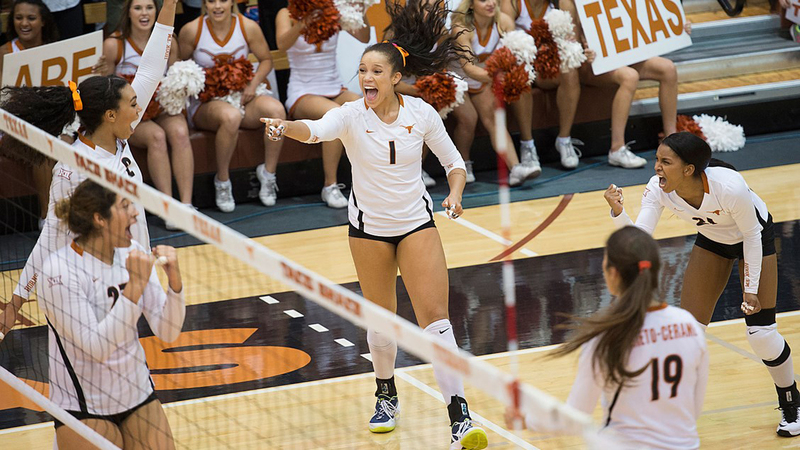 Mice White and the Mustangs will make the Texas volleyball program's 35th appearance in the NCAA tournament (photo courtesy of texassports.com). AUSTIN, Texas — The Texas volleyball team, ranked No. 5 in the country, will open the Austin subregional of the NCAA tournament at 7 p.m. Thursday at Gregory Gym against Stephen F. Austin. Texas (20-4 overall, 15-1 in matches against Big 12 opponents) is the tournament’s fifth seed. The winner of the Texas-SFA match will face the winner of the Rice-Texas State match at 8 p.m., Sunday, Nov. 30. The winner of the Austin subregional will move on to the regional semifinal Friday, Dec. The semifinals and final of the NCAA Championship will be held in Minneapolis, Minnesota. The NCAA tournament will be the 35th for the Longhorns, who have been selected to host the first and second rounds 29 times; UT is 68-9 all-time in matches played in Austin. Tickets for single days and for the full session are available at texassports.com/tickets or by calling 512-471-3333, or can be purchased in person at the Sandeep Soni ticket office in Bellmont Hall; the ticket office is open from 9 a.m.-5 p.m. Monday through Thursday, and from 9 a.m.-4 p.m. Friday.